It won’t be difficult to play HD videos on iPhone or iPad when you using the media streaming services such as Netflix, YouTube, iTunes and other legacy sources under the wi-fi connected situation. However, if you are planning to go out for a travel and there are also lots of MKV movies (1080p or 720p) on your local computer, you’ll be disappointed to find that your iPhone or iPad doesn’t play those files, especially MKV files with AC3 audio codec. How to fix this format incompatible issue? The following article has listed some iOS video players that support MKV video files playback, some are totally free, some will cost your some money. VLC for iOS is the baby brother to the VLC that we have all been using on the desktop for years. It may be for mobile but it’s full of features and costs nothing, which is a bonus. 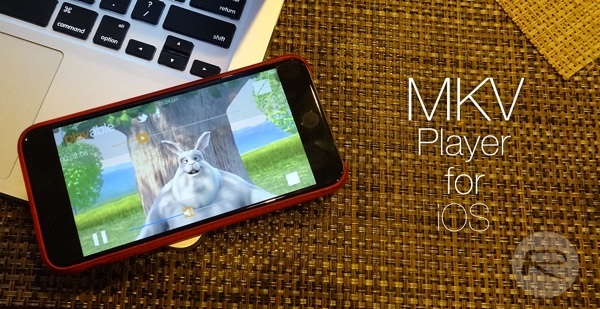 By far, this is the easiest way to play MKV files iPhone or iPad. Playable is available in both free and PRO versions, with the latter costing $1.99 and free of adverts. Playable handles mkv formats well but not the HD formats. However, it supports HD for every other format. For handling HD MKV files, you will need to download the Pro version. The 8player lite features a cool interface. It’s as much powerful as the playable and 1080 MKV Player but has a sensible design that is familiar and intuitive. Support for HD video is pretty good. However, customers do note that it’s very restrictive for a lite version so you don’t really get to explore all the features it provides in the pro. Two great apps, both costs $2.99, the AVPlayer apps offer controls for playback speed, video scrubbing and USB or Wi-Fi transfer for getting content into the app. You can passcode protect content too. Certainly not cheap at $4.99, nPlayer is a universal app that supports almost all kind of video formats and codecs without file converting efforts. With support for video files we’ve never heard of and all the Dolby audio codecs you could want though, nPlayer may be worth checking out even with that price taken into account. The newly updated Infuse 3 app supports DTS and DTS-HD audio for video files that have it. The app is also probably the best looking video player in this list as well. Infuse 3 is free to download but comes with a bunch of in-app purchases if you want to unlock its full potential. The IAPs range from $2.99 to $9.99, but the free base version of the app will cover most bases in terms of video playback. Costing $3.99 for the iPad and $1.99 for iPhone, CineXPlayer HD supports 3D video of sorts as well as all the usual video formats and video output capabilities you would expect to see from an app on this list. Live TV channel support gives this app a leg up on most others though, should that be a consideration for you. Available in free / Pro flavors and with the ability to talk to game consoles and other potential devices that can act as a go-between for getting content onto a big sccreen, MCPlayer offers in-app purchases which unlocks advanced features. The free player should be enough to get you started though. You can download MCPlayer HD free from here and Pro from here. MCPlayer free from here and Pro from here. Both Media Player Pro and Media Player HD Pro come with the usual array of features including support for HD formats, video thumbnails and enough file formats to keep even the most demanding of users happy. It is even capable of playing audio in the background when the app is closed. Good stuff. As a container file format, MKV can include unlimited number of video, audio and subtitle tracks. If above listed MKV players does not play MKV files encoded with some special codec such as H.265/HEVC, you can use a third-party application such as Pavtube Video Converter for Mac (support Mac OS X El Capitan)/Windows to either convert MKV to iTunes supported file formats for syncing to iPhone or iPad or directly output MKV to iPhone or iPad preset profile formats according to your device models. Can’t Upload MKV video to Instragram for sharing? How to Play all MKV files on Plex? How to Convert MKV Video and Move to iTunes Library? How to Smoothly Stream MKV to Chromecast via Plex Media Server? Any good Software for MKV Video Download from Youtube to Android phone?